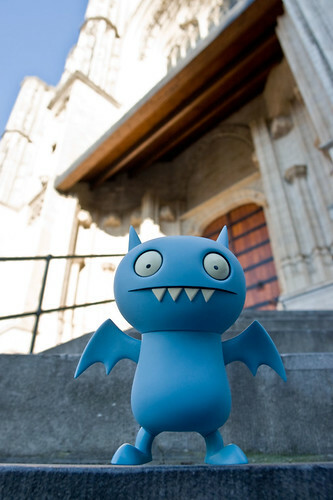 Uglyworld #469 - Ice-Bat at Leuven Dom, originally uploaded by www.bazpics.com. While the guys have been down here in Leuven they've been making the most of the time to check out some of the main sights around the Belgian city while I've been working. Tonight the pair of them were showing off their images, first up we have Ice-Bat who said that he spent most of the afternoon flying all around the spires and cool other parts of the "Dom", which basically means the main central church/chapel of the city. "It's flippin' ma-hoosive" said Ice-Bat while quickly catching his breath before taking off for another trip around the dizzy heights of the Dom's roof.